The worst thing that could happen to Tucker is the re-election of the 3 current encumbents. All three deserve marching orders but Hyams more than the others. 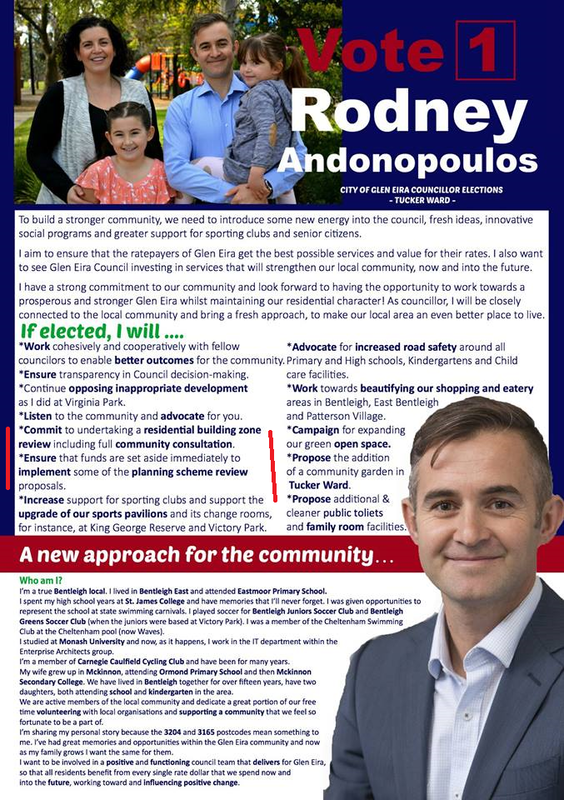 There’s the usual politspeak and promises but I like the fact that Mr Andonopoulos is prepared to put down in writing some concrete things he would do in relation to the zones. That’s more than most of the others that I’ve seen have done thus far. A cohesive, transparent and proactive council is required. if you would like to send us your flyers, or policy statements, we would feature them as a post. There are a number of issues that I believe need to be strategically addressed…not band aids, quick fixes that cost a fortune and are inadequate or poorly executed. In 2012 Rod Andonopoulos outpolled Magee on primary votes. He almost scrapped in. Magee fluked it by gathering preferences that he never anticipated. Lucky Jim. Second time around he stands a good chance. Is Andonopoulos preferencing Magee again? Better question – is Magee preferencing Rod or the Liberals?